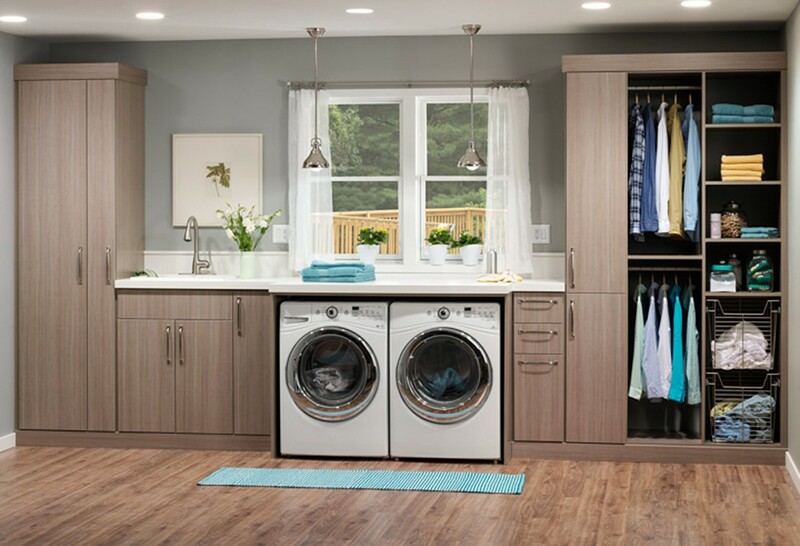 Who wouldn’t love a more efficient laundry room which was more efficient, organized and can reduce the stress of doing the not-so-fun task of laundry? Innovate Home Org (a professional designer and installer of cabinets and storage systems) can help you turn your cluttered Columbus laundry room into a more organized and space efficient area with customizable laundry room cabinets. 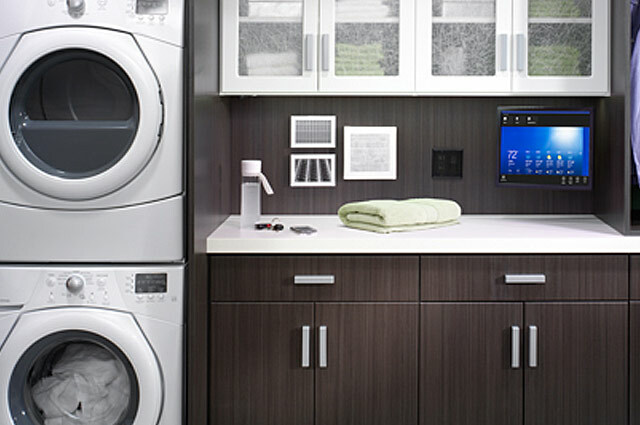 In this page Innovate Home Org (an authorized Dealer of Org Home) will provide you with the benefits, features and answer your questions about laundry room cabinets and provide you with solutions to this often over-looked (but frequently used) room of the home. Arctic White laundry room cabinetry provides a classic and clean look which blends well with white woodwork. Pull out basket makes it simple to reach cleaning supplies. Hanging rods provide a convenient place to put shirts after ironing or to air dry delicate garments. Shelves are easy to adjust as your needs change. Slide out hamper can help to separate clothes before you put them in the wash. This thinner cabinet was specifically designed to fit a full sized ironing board without taking up too much room. 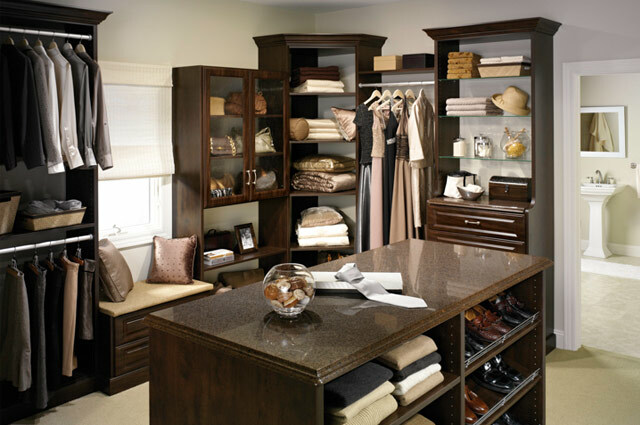 Floor mounted cabinets with decorative trim at the top provide a finished and upscale look. 2” thick Forterra white counter around the sink provides a clean work surface. You’ll also love the sustainable design elements of this counter. C shaped handles are easy to open and ergonomically correct. Convenience is key – this flip open laundry basket is an easy place to throw (and keep organized) different color clothes before you’re read to throw a load in the washer. The upper cabinets by the stacked washer and dryer were custom sized to fit to match the width of these appliances – maximizing space. Floor to ceiling cabinet design makes use of every vertical inch of space. The white cabinets tie in the color scheme of the white washer and dryer. This wall hung cabinet offers a cost effective storage option whether your home is in Upper Arlington, Pickerington or anywhere in Columbus. Drawers fully extend to be able to reach items in the back. The open rod is a convenient place to hang clothes after they’ve been ironed. The raised panel design is a perfect fit for a traditional home. Open shelves work to stage freshly ironed shirts and folded clothes. Concealed cabinets are perfect places to put ironing boards and cleaning supplies you want to keep out of the sight of young children. This floor mounted design makes perfect use of space by designing a higher and level rods to provide 2 times the hanging space. These Euro designed cabinets look wonderful in the Driftwood finish. Here’s a convenient idea – a small ironing board which folds out in 3 different positions for quick touch ups before you go that formal Central Ohio event. Arctic white countertop provides a bright work space to fold clothes. Polished aluminum drawer fronts provide a modern look and are easy to grab. The slide out hamper in this open shelf design is a quick place to put dirty clothes before you’re ready to run the wash. Shelves can be easily adjusted as your needs change. The pull out basket – which fully extends – is frequently used for handy place for cleaning supplies. The hooks mounted on this cabinet door put your mops and dusters easily at hand. Shelves can be adjusted to match the height of your cleaning supplies. A door mounted basket keeps small items right there for you to grab and go. The Driftwood door and cabinet finish style is contemporary, yet warm. Being able to hide trash cans or your items for recycling allows will allow your home to feel neat. 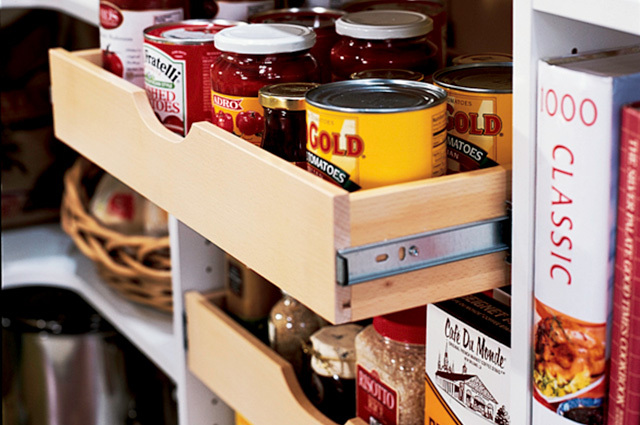 The fully extending cabinet slides out so you can simply get to the back. The “Caviar” thermally fused laminate finish is easy to clean and provides a luxury look. This innovative Forterra countertop is a bold 2” thick structural material which has been made with recycled content and is designed for maximum rigidity. Our manufacturing partner (The Stow Company) uses 100% recycled and/or recovered wood fiber for our cabinetry panels. Cleaner look – When your clothes are organized and stored in hampers, cleaning products are concealed respective drawers, and garments are hung neatly to prevent them from wrinkling a laundry room can actually feel good to be in. Gain more storage space – If you don’t have enough laundry room storage in your older Bexley or Upper Arlington home adding cabinetry above the washer and dryer or adding open shelves in the small nooks and crannies of your room can really help. Cabinet and counter designs which are ergonomically correct and environmentally friendly – Having to bend down to reach cleaning products or being cramped find the room to navigate ironing a dress before a big meeting in downtown Columbus can be tough on your body. With pull out baskets or slide out ironing boards your space is better used and easier on your body. In addition Innovate offers environmentally conscious products which are manufactured with a focus on sustainability. 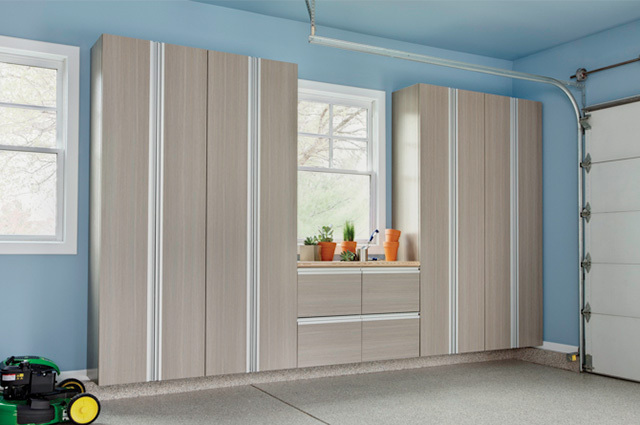 Custom designed to fit your space and style – Instead of buying stock cabinets which may leave badly needed spaces unused – your Innovate Home Org laundry room cabinets will be custom designed for your Columbus home – ensuring there will be no wasted space. Saves your time – An efficient laundry room will reduce the time it takes to do this chore to free up more time for family. Design flexibility – Since we offer adjustable shelves, pull out bins and baskets and different ironing board options you’ll know your space can grow and change with your ever-changing family. Style, color and finish selections to fit any home – Your laundry room cabinets and shelving can express your individual style with 16 standard colors, 9 wood veneer finishes and 5 texture options in our unique structurally strong and environmentally conscious Forterra line. So whether you have a contemporary minimalist home in Short North or a sprawling traditional luxury home in Dublin we have a style to cover your tastes. Drawers and rods to make things easier on you – Our full extension drawers make it easy to see what’s stored deep in the back of your laundry room cabinets Several rod options – including a wardrobe valet rod and tiered valets allow you to neatly hang clothes so you’ll know they won’t get wrinkled before you have the time to move them into their respective closets. An environmentally conscious counter with superior strength – As you Innovate Home Org rep to tell you more about our “Forterra” line. It is a 2” thick product built from recylcled content which can span up to 60” and creates a clean and contemporary and bold look. 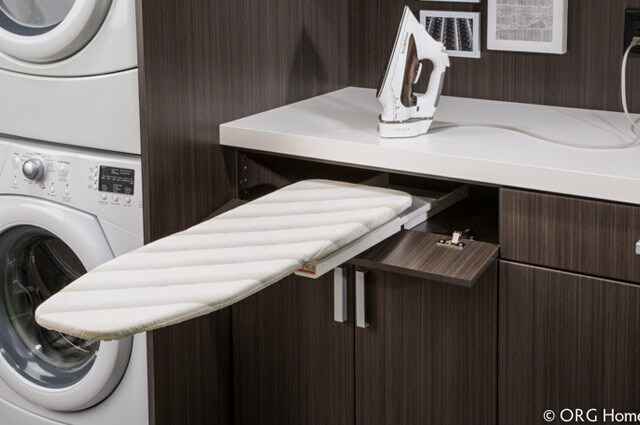 We can use this product to create a laundry room counter to provide an area for you to fold, flat dry, or remove stains from your families’ clothes. Adding color, a textured finish, or an architecturally correct door and drawer selection can help you to fashion your laundry room to match with your budget, needs and interior design style. 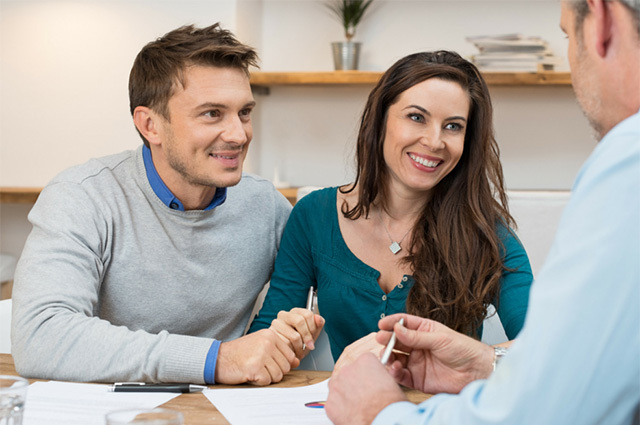 Explore the wide array of options below or with your Innovate Home Org Design Consultant.